The Cassini spacecraft passed 119,049 kilometers over the hazy atmosphere of Titan, which is rich in hydrocarbons. The Cassini spacecraft has been a constant companion of Saturn for 13 years, and is nearing the end of its mission. Cassini has executed the final distant flyby of Titan, in a maneuver known as the "goodbye kiss". The gravitational assist maneuver executed during the flyby allows Cassini to slow down slightly, and puts it on track to plunge into the atmosphere of Saturn, in a final science rich dive. 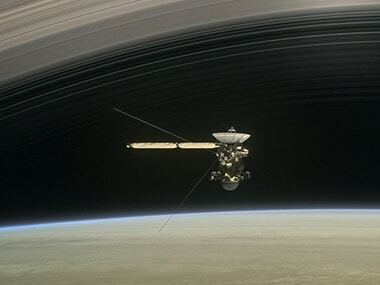 An artist's impression of Cassini during its grand finale dives. Image: NASA. Cassini began the last of its grand finale dives by measuring the amount of helium, hydrogen and ions in Saturn's atmosphere. The spacecraft then passed 119,049 kilometers over the hazy atmosphere of Titan, which is rich in hydrocarbons. The final half orbit of Cassini is yet to start, and there are no further flybys scheduled for any of the Saturnian moons. Normally, Cassini holds on to the data it collects for a few hours or even days before turning its antenna to the Earth and beaming them home. During the final science rich dive, Cassini will be beaming back its observations in almost real time, till the very moment that it becomes a shooting star in the atmosphere of Saturn, ending its mission. Cassini is a joint mission by NASA, the European Space Agency and the Italian Space Agency. The spacecraft is being destroyed as there is no fuel left to maintain control of Cassini, and the spacecraft could potentially drift into the moons of Saturn. This is not desirable as the space agencies do not want to contaminate the moons, which may harbour life. The most promising candidates among the Saturnian moons to support life include Enceladus and Titan.